Storage allocate type (pointer allocator). Base vector const reverse iterator. Unsigned integral type for size values. Assigns a number of value copies. Assigns values from an iterator range. Gets an Iterator for this Vectal positioned at the first value. Gets a Const_Iterator for this Vectal positioned at the first value. Removes, and destroys, all values. Gets an Iterator for this Vectal positioned after the last value. Gets a Const_Iterator for this Vectal positioned after the last value. Removes a value at an element index position. Removes a value at an iterator position. Inserts a value at an iterator position. Inserts a value at an element index position. Inserts a number of value copies starting at an iterator position. Assigns values from another Vectal. Gets a mutaable value pointer at an iterator position. Gets a const value pointer at an iterator position. Gets the last value pointer. Inserts a value pointer (not a value copy) at an iterator position. Inserts a value pointer (not a value copy) at an element index position. Pushes a value pointer (not a value copy) on the end of the Vectal. Removes and returns the last value pointer. Removes the value pointer at an iterator position. Pushes a value on the end of the Vectal. Gets a Reverse_Iterator for this Vectal positioned at the last value. Gets a Const_Reverse_Iterator for this Vectal positioned at the last value. Gets a Const_Reverse_Iterator for this Vectal positioned before the first value. Gets a Reverse_Iterator for this Vectal positioned before the first value. Resizes by removing excess elements, or adding new ones. Construct from an Iterator range of values. Construct with with a number of value copies. Provides access to the base vector. Removes all of the value pointers, but does not destroy the values. Destroys the Vectal and its contents. Catches values as they are being entered into the Vectal. Catches values as they are being removed from the Vectal. A Vectal is a vector of virtual objects of any type. 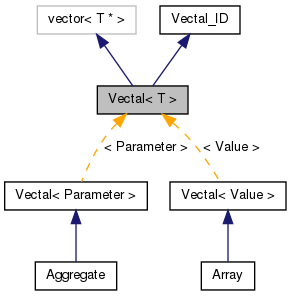 From the user's point of view a Vectal is a vector of objects of the class specified by the template parameter. The interface is essentially the same. The Vectal provides efficient storage of, and access to, objects by only storing their pointers into the corresponding vector from which it is derived. This also allows the Vectal to contain objects of pure virtual polymorphic classes which can only be used with pointers or references (since they can not be constructed directly). Abstract_Class (const Abstract_Class&);	// Copy constructor. Implementing_Class (const Implementing_Class&);	// Copy constructor. Note: These methods copy and delete pointers - not the objects they point to - into and out of the backing vector. The two erase methods delete the value object(s) in the Vectal before they erase the value pointer(s) directly from the Vectal; they do not use the pull methods because the intent is to destroy the erased objects, not just to remove their pointers from the Vectal. Iterators are provided that implement reference semantics: their dereference (*), pointer (->) and indexing () operators automatically dereference the object pointers in the backing vector. Thus, from the user's perspective the iterators appear to reference object values directly just as vector iterators do. However, instead of copying out objects as do vectors, direct object value references to the contents of the Vectal are provided. The Vectal class is flawed. One could easily make the argument that there is no need for a Vectal; a vector of pointers to virtual types should be sufficient. However, the author wanted to provide the convenience of reference semantics, transparent reusability with different subclasses, and insert and removal hooks to the virtual class being managed to allow them to take special action for their own purposes. Thus the justification for the Vectal. However, the Vectal does not correctly satisfy all the requirements of an STL container (see Josuttis, "The C++ Standard Library", sect. 5.10.1). In particular the elements of a Vectal are not copyable by a copy constructor. As pointed out above, the virtual elements of a Vectal require the use of a clone method for the elements of the class being managed. However the STL containers, which work with copies of their elements, use copy constructors, not a clone method. This results, at best, in object slicing at copy time. Pointers can, of course, be easily copied. But the STL containers do not, in the process, copy (i.e. clone) the object being pointed to. This can cause unacceptable problems when the user expects each element in a container to be unique. The problem of the copy constructor for virtual classes poses a major challenge. The effect of this is that Vectals do not always work well with STL algorithms. Sorting is an excellent example: It is obviously necessary to be able to compare the values of the elements being sorted; thus using a vector of pointers to the objects to be sorted will not do. This is solved by having the Vectal iterators implement reference semantics. However, reordering elements requires that temporary copies of elements must be made. It would be fine to copy and reorder the backing pointers, but the Vectal iterators reference semantics brings up the copy constructor problem. Many STL algorithms will still work just fine with a Vectal as long as they do not have to make copies of the Vectal elements. Reimplemented in Aggregate, and Array. vectal The Vectal to be copied. size The number of value copies with which to initialize the contents. value The value to be copied. The values in the range [start, stop) are used to intialize the contents. start An Iterator positioned where the range starts (inclusive). The position is not range checked. stop An Iterator positioned where the range stops (exclusive). The position is not range checked. The value elements are destroyed before destroying the Vectal. index The range checked index of an element. A reference to the value at the indexed element. out_of_range If the index is not in the range of existing index elements. N.B. : This exception will always be thrown if the Vectal is empty. Referenced by Vectal< Value >::at(). A const reference to the value at the indexed element. Unchecked - faster, but not safe - access to an indexed element. index An element index of a value in the Vectal. N.B. : The validity of the index is not checked. Referenced by Vectal< Value >::assign(), Vectal< Value >::back(), Vectal< Value >::front(), and Vectal< Value >::operator(). N.B. : The Vectal must not be empty. A reference to the first value. A const reference to the first value. A reference to the last value. Referenced by Vectal< Value >::peek_back(), Vectal< Value >::pull_back(), and Vectal< Value >::resize(). A const reference to the last value. position The iterator position to peek at. The position is not range checked. A pointer to the value at the position. This will be NULL if the Vectal is empty. Referenced by Vectal< Value >::erase(), Vectal< Value >::pull_out(), and Vectal< Value >::replace(). A const pointer to the value at the position. This will be NULL if the Vectal is empty. A pointer to the last value. This will be NULL if the Vectal is empty. A reference to the base vector of object pointers. This is equivalent to dynamic_cast<Base&>(*this). This stub does nothing by default. It should be overridden by subclasses that want to apply special handling to the object before they are entered into the Vectal. value_pointer The value pointer that is being entered into the Vectal. Referenced by Vectal< Value >::poke(), Vectal< Value >::poke_back(), and Vectal< Value >::replace(). Any existing values, up to the number being assigned, are assigned from the value provided. The value's own assignment operator is used. Any excess values are removed. A shortfall is filled with copies of the value. number The number of value copies to assign. Referenced by Vectal< Value >::operator=(), and Vectal< Value >::Vectal(). Dereferencing (operator*) the Iterator must provide a reference to an object of the type contained by this Vectal. Existing values are replaced by assignment. Excess input values are appended. Excess existing elements are erased. vectal A Vectal of the same type as this Vectal. 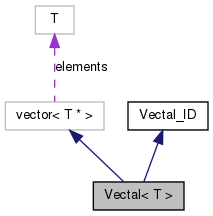 Referenced by Vectal< Value >::Vectal(). A clone pointer of the value is poked into the backing vector. position The iterator position where the value is to be inserted. The position of the inserted value. Referenced by Vectal< Value >::insert(), and Vectal< Value >::poke(). If the index is greater than or equal to the size of the Vectal the value is appended. index The element index where the value is to be inserted. position The iterator position at which to start inserting the values. number The number of value copies to insert. A clone pointer of the value is poked into the end of the backing vector. Referenced by Vectal< Value >::assign(), Vectal< Value >::poke_back(), and Vectal< Value >::resize(). N.B. : The value pointer is provided to the entering method before being inserted into the backing vector. If the VECTAL_CAPACITY_MARGIN is not 0 and the allocated storage capacity has been reached, then storage reserve is increased to the next largest multiple of the margin amount. position The iterator position where the value pointer will be placed. The position is not range checked. value_pointer The value pointer to be stored. The iterator positioned at the new value. value_pointer A pointer to the value to be inserted. N.B. : The value pointer is provided to the entering method before being pushed on the end of the backing vector. Referenced by Vectal< Value >::poke(), and Vectal< Value >::push_back(). This stub does nothing by default. It should be overridden by subclasses that want to apply special handling to the object before they are removed from the Vectal. value_pointer The value pointer that is being removed from the Vectal. Referenced by Vectal< Value >::erase(), Vectal< Value >::pull(), and Vectal< Value >::replace(). The removed element is destroyed. position The iterator position of the value to be removed. An iterator positioned at the next value (or the end position). If the Vectal was empty then nothing is done and the original position is returned. Referenced by Vectal< Value >::assign(), Vectal< Value >::clear(), Vectal< Value >::erase(), Vectal< Value >::pop_back(), Vectal< Value >::pull(), and Vectal< Value >::resize(). index An element index position. N.B. : Nothing is done ff the index is greater than or equal to the size of the Vectal. Referenced by Vectal< Value >::wipe(), and Vectal< Value >::~Vectal(). Warning: It is the user's responsibility to make sure that the value objects are properly managed to prevent a memory leak. This method might be used if the value pointers have been copied elsewhere, or the value objects have already been destroyed. Does nothing if the Vectal is empty. The value that is removed is erased. Referenced by Vectal< Value >::erase(), Vectal< Value >::pull_back(), and Vectal< Value >::pull_out(). The value itself is not destroyed. position The iterator position of the value. The value pointer removed. This will be NULL if the Vectal is empty. Referenced by Vectal< Value >::pull_out(). To increase the size a value is needed to fill the space. Virtual classes have no default constructor so the last value is used to copy into the extra space. However, if the Vectal is empty there's nothing to copy so an out_of_range error will be thrown in this case. new_size The new size for the Vectal. Referenced by Vectal< Value >::assign(), and Vectal< Value >::resize(). Nothing is done if the Vecatal is empty. N.B. : The previous value pointer at the iterator position is provided to the removing method. The value is not destroyed. The new value pointer is provided to the entering method before replacing the previous pointer in the backing vector. position The iterator position of the value. The position is not range checked. The value pointer replaced. This will be NULL if the Vectal is empty. An Iterator positioned at the first value. Referenced by Vectal< Value >::assign(), Vectal< Value >::begin(), Vectal< Value >::clear(), Vectal< Value >::erase(), Vectal< Value >::operator=(), Vectal< Value >::poke(), and Vectal< Value >::pull_out(). An Iterator positioned after the last value. Referenced by Vectal< Value >::assign(), Vectal< Value >::clear(), Vectal< Value >::end(), Vectal< Value >::operator=(), Vectal< Value >::pop_back(), Vectal< Value >::pull_back(), and Vectal< Value >::resize(). A Const_Iterator positioned at the first value. A Const_Iterator positioned after the last value. A Reverse_Iterator positioned at the last value. Referenced by Vectal< Value >::rbegin(). A Reverse_Iterator positioned before the first value. Referenced by Vectal< Value >::rend(). An Const_Reverse_Iterator positioned at the last value. An Const_Reverse_Iterator positioned before the first value.